ESPN's iconic college football preview show will make its first-ever appearance at UCF on Saturday ahead of the Knights' nationally televised primetime matchup against Cincinnati. 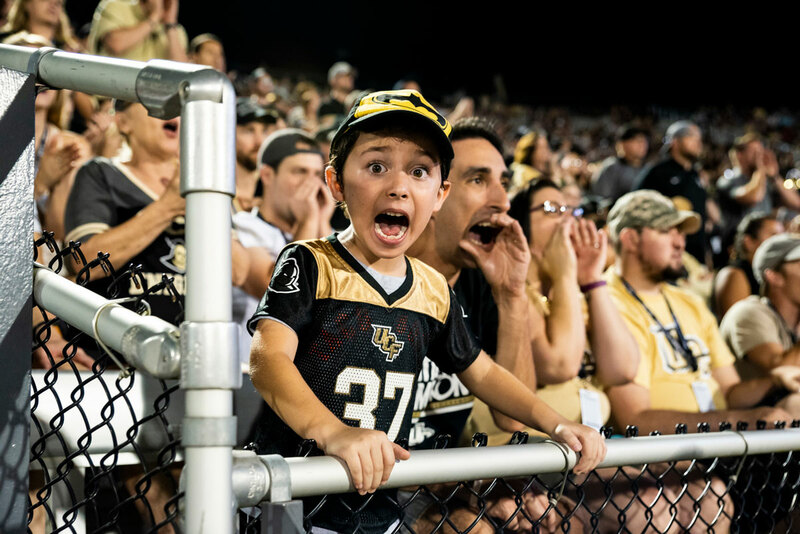 ESPN's College GameDay announced Sunday it will be coming to UCF's campus for the first time when the Knights take on Cincinnati in their final regular season home game at Spectrum Stadium on Nov. 17 at 8 p.m. The game will be aired on ABC. Get your signs and flags ready, Knights fans. ESPN’s College GameDay is coming to UCF’s campus for the football team’s primetime matchup against Cincinnati on Nov. 17. ESPN’s iconic college football preview show, which airs from 9 a.m. until noon every Saturday from different sites throughout the season, will make its first-ever appearance at UCF on Saturday. 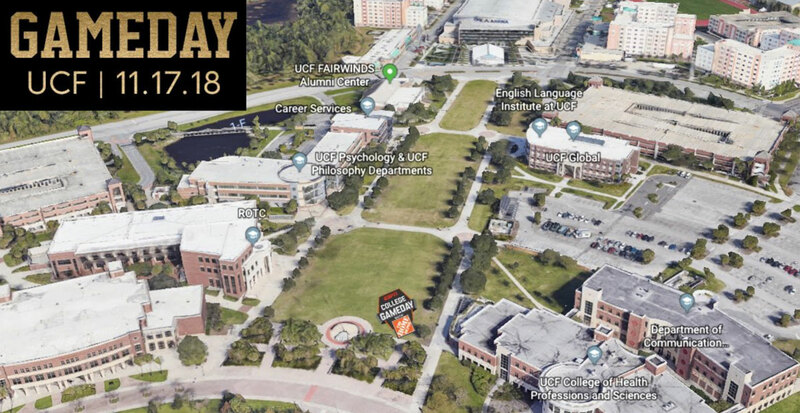 The College GameDay set location was tweeted by @UCFKnights Sunday night. It will be in prime tailgate territory in the southeast corner of Memory Mall near the Veterans Commemorative Site. More details will be announced as soon as possible. “If you look at the slate of games, there’s really one game that stands out, and this fan base has been waiting for College GameDay for the last two years to recognize their program and bring College GameDay to Orlando. This is the week that it happens,” tweeted Kirk Herbstreit, analyst for the show. In addition to College GameDay visiting, the No. 11 Knights (9-0) will host the No. 19 Bearcats (9-1) at 8 p.m. EST at Spectrum Stadium and will be aired on ABC. UCF will be playing to clinch the American Athletic Conference East Division Championship and a berth in the American Athletic Conference Championship game for the second consecutive year. The Knights are coming off a Homecoming win over Navy, marking the team’s 22nd straight victory. Meanwhile, Cincinnati has rebounded with three straight wins after recording its only loss of the year at Temple on Oct. 20. On Monday evening, UCF Athletics announced Saturday’s game is a sell-out. UCF students can still claim their tickets through ucfstudenttix.com. (Note: claiming a ticket does not guarantee entry.) Gates open at 6:30 p.m., but early arrival to the stadium is strongly encouraged as seating is first come, first served. Once students arrive at the gate, they MUST have their UCF student ID and mobile ticket. Student guest tickets are also officially sold out. 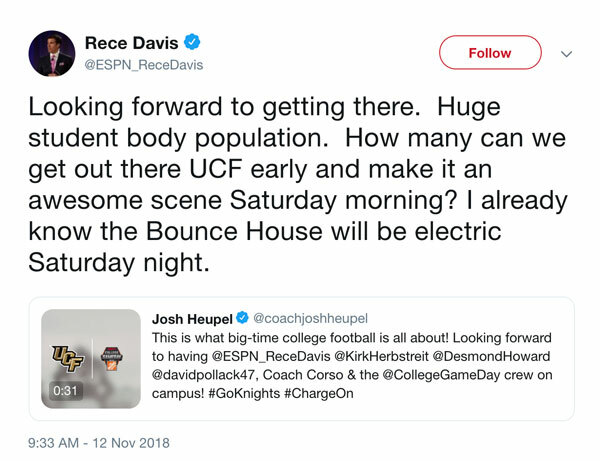 Longtime ESPN commentator and former GameDay host Chris Fowler, who will be calling Saturday’s broadcast for ABC, appears to be amped about coming to UCF. Davis has a history with the Knights as the TV play-by-play caller of the famous “Hail Perriman” finish in 2014 at East Carolina — Breshad Perriman’s last-second, game-winning touchdown from quarterback Justin Holman that clinched the American Athletic Conference title. As anticipation continues to grow, shopucfknights.com began selling UCF-themed College GameDay T-shirts (while supplies last). With GameDay on campus and a nationally televised showdown under the lights on ABC, next Saturday is shaping up to be one of the biggest days in the football team’s 39-year history.